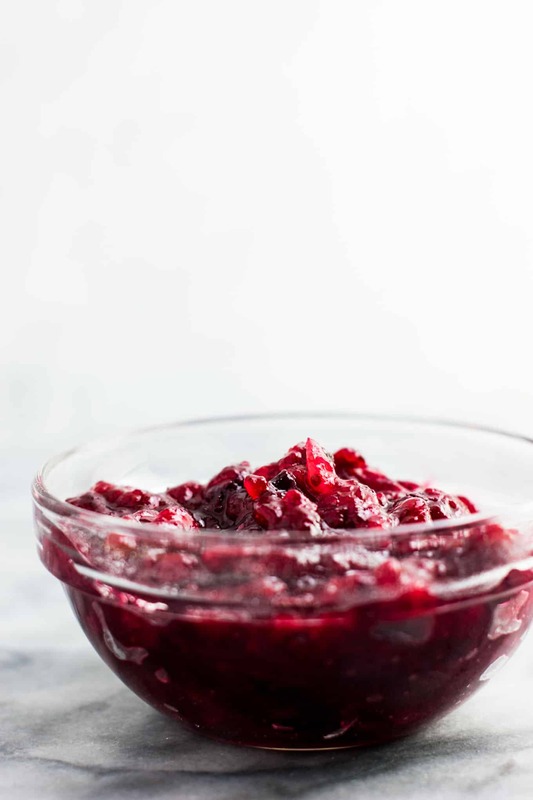 This healthy cranberry sauce has been on my Thanksgiving table every year for years. Tangy, sweet, and worth fighting over at the Thanksgiving table! Once you taste this recipe you’ll never buy the canned stuff again! It’s one of the best Vegetarian Thanksgiving Recipes. All you need is fresh cranberries, maple syrup, and salt. 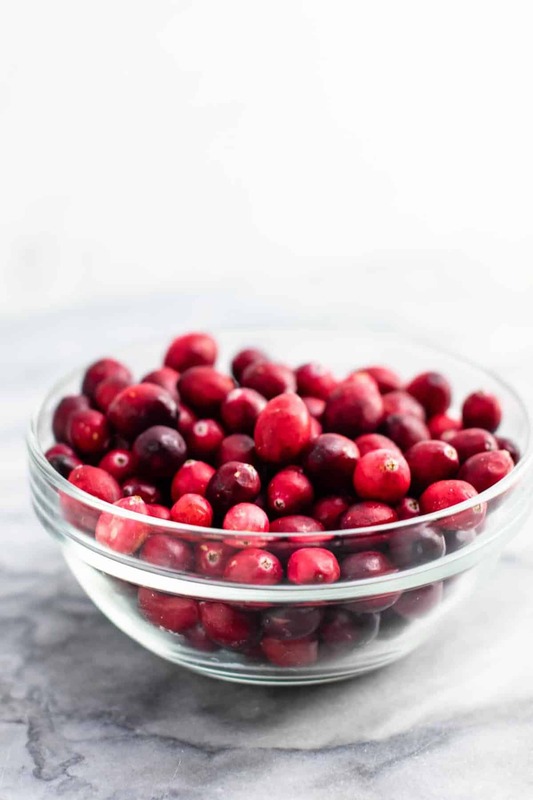 This healthy cranberry sauce is a traditional favorite every year at our Thanksgiving table. Growing up, I absolutely hated cranberry sauce from a can, and I don’t believe I ever tasted a homemade one made with fresh cranberries. I had no idea what I was missing out on! Our family never used fresh cranberries, but I live for them every winter now. From cranberry eggnog bread, to cranberry cream cheese muffins, cranberry blueberry crisp, cranberry apple butter, cranberry orange muffins, cranberry apple crisp, to cranberry white chocolate chip cookies. 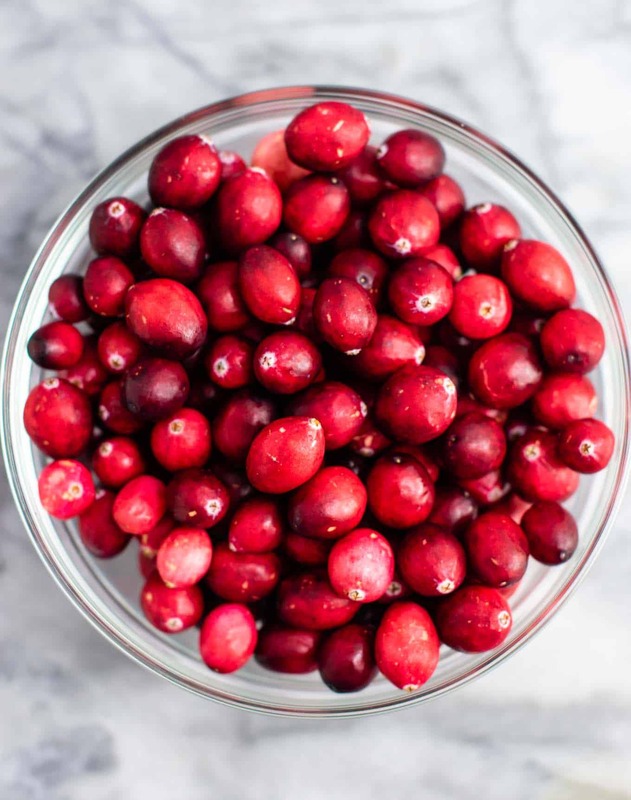 Fresh cranberries are tart, and add so much sweet tart delicious flavor to holiday treats! Holidays just aren’t the same without delicious fresh cranberry recipes. 2) an overly sweet sauce that somewhat resembled cranberry but tasted just about as bad as the stuff from the can. I didn’t care for either one and cranberry sauce was a big no from me for many years. Now that I’ve made my own cranberry sauce, I can’t imagine Thanksgiving without it! This sauce is tangy, sweet (but not overly so) and I could eat it by the spoonful. As a former cranberry-hater, that’s saying something! Perfect taken with bites of (vegetarian for us) turkey, stuffing, mashed potatoes, and every savory Thanksgiving dish! Read my post on 17 best vegetarian thanksgiving recipes for all of our family favorites! I can’t eat my Thanksgiving favorites without a bite of healthy cranberry sauce along with it! If you have never liked cranberry sauce, or want to try making it yourself, this recipe is perfect! It is so simple and only takes 15 minutes to make. No fuss, easy, and tastes delicious every time. Add the cranberries, maple syrup, and salt to a medium sized sauce pan. The cranberries should be bright red and firm to the touch. Try to avoid mushy darker colored cranberries, as this means they are starting to turn bad. Heat the pan until the mixture starts to boil. At that point, turn the heat to low, and stir the cranberry sauce often for 10 – 15 minutes. 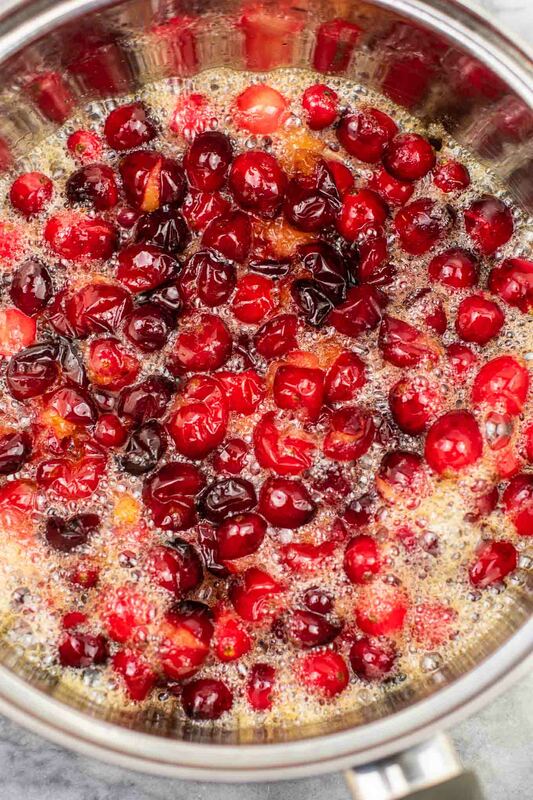 As the cranberries cook, they will start to get soft. 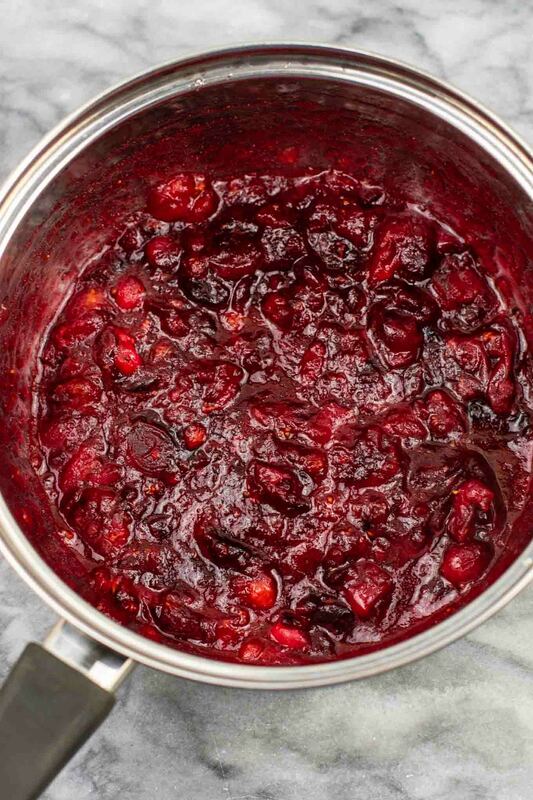 Use the bottom of a spoon to mash the cranberries as you go. Once you are finished, the sauce should look like the picture below. Perfectly thick, sweet and tangy. Transfer to a dish and store in the fridge until ready to serve! That is it! So simple and so delicious. It really could not be any easier to make. You can even make it the day before and store in the fridge until it’s time for Thanksgiving dinner. I do this every year to save on time. I love making what I can ahead when preparing for Thanksgiving since I’m usually in a time crunch the day of. For more recipes and time saving Thanksgiving tips, read my post on 17 of the best vegetarian thanksgiving recipes. 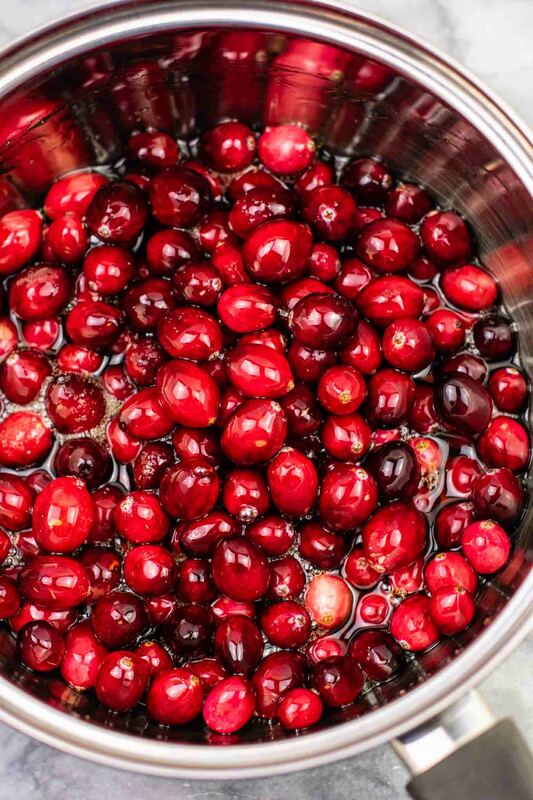 Cranberry sauce always gets made ahead of time. If you have never made cranberry sauce before, I hope you will try it! Be sure to leave a comment and let me know how it turns out. Looking for more delicious Thanksgiving favorites? Be sure to also read our post on 17 Best Vegetarian Thanksgiving Recipes + all our tips and tricks for cooking a vegetarian thanksgiving dinner! 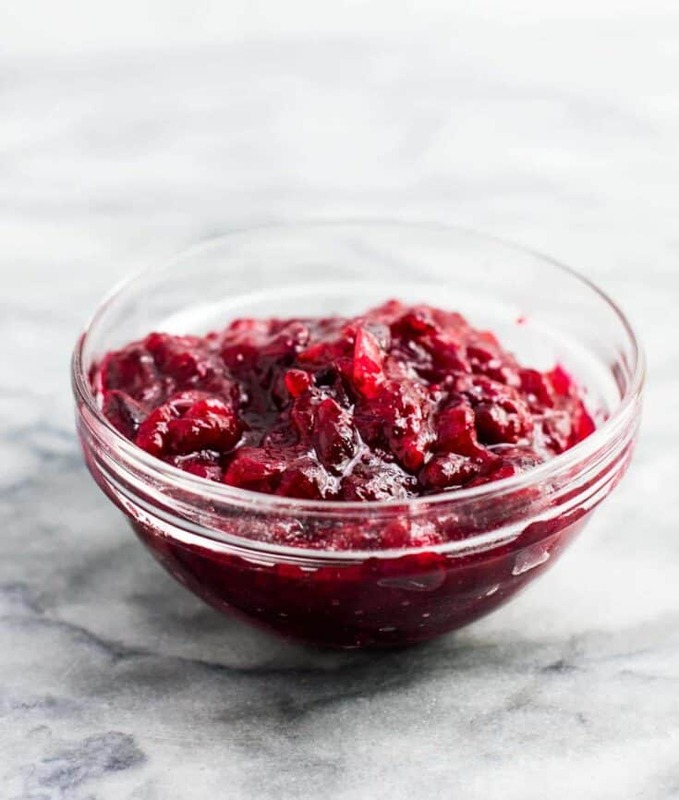 This healthy cranberry sauce is the perfect mix of tangy and sweet! Just 3 ingredients, low sugar, and vegan. Uhh… no need to add water? This was so easy to make, and it does taste good. I put a little orange peel in it, because that’s how our family likes it. I’ve never cooked with whole cranberries before, and it was fun to hear them pop in the syrup. It turned out thick and sweet/tart, so I’ll probably be making it again. I don’t have a nonstick pot, so was worried that my stainless steel pot would be hard to clean, but the residue washed right out. Thank you for this recipe. So glad you enjoyed it Lynn! Amazing! I will be using this recipe for now on in place of the tradutuonal refined sugar recipe. Although I may take it down to 1/2 a cup of maple syrup next time. Thank you so much for sharing. So glad you enjoyed the recipe Jenn! We love this recipe and make it every Thanksgiving! This recipe is super fast, easy and fun! I used 1/3 cup of maple syrup. Just right.